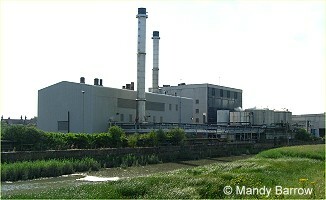 Many towns and factories are built near rivers so that they can use water from the river. 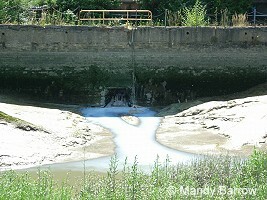 But sometimes the water is not cleaned before it is put back into the river. This dirtying of water (also air and soil) is called pollution. Rubbish like crisp packets, newspaper and bags. Farmers put fertilizers and pesticides on their crops so that their crops grow better. But these fertilizers and pesticides can be washed through the soil by rain, to end up in rivers. Fertilizers and pesticides are harmful because they cause algae to grow. 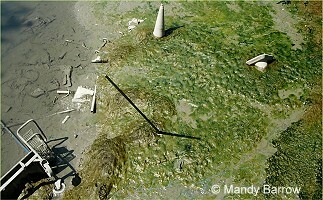 The algae then destroy water plants. People are sometimes careless and throw rubbish such as bottles and crisp packets directly into rivers. Pollution kills water plants and animals. Polluted water also carries diseases. When animals drink the water, they may get diseases which can kill them. People can even get these diseases by eating the infected animal. This happens a lot in poor countries in Africa where people get untreated water directly from the river. 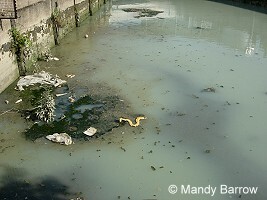 Rivers look unsightly when there is rubbish in them. Efforts are being made to clean dirty rivers. Water companies like Southern Water are spending a lot of money to clean up dirty rivers. 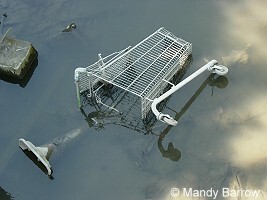 There are fines for companies and people who deliberately throw rubbish into the river.